BE SEEN… AND HEARD by Jim Corbran, Automotive Columnist Although I’m not sure that in this day and age it’s wise to name your new truck “Rebel,” you’ve gotta admit that Fiat Chrysler Automobiles (FCA) has, in the Limited Edition Mopar ‘16 Ram Rebel 4x4 Crew Cab, built a truck sure to never get lost in the mall parking lots of America. Available in either a Flame Red/Brilliant Black two-tone, or a Brilliant Black monotone, the Ram Rebel will be limited to only 500 copies, from FCA’s Mopar Custom Shop. Included on all Mopar ’16 Rebels will be 17-inch satin black wheels, black front bumper skid plate, wheel flares, a serialized badge, and special graphics. Oh, as FCA points out, and more. Part of that “more” consists of a slew of available dealer-added customization parts. Under the Rebel’s hood is a — what else? — 5.7L Hemi, which is mated to an eight-speed TorqueFlite automatic transmission, while underneath are transfer case and front suspension skid plates. Easing your entry are black tubular side steps, while the cargo bed is protected by a spray-on bedliner and tri-fold tonneau cover. Starting at MSRP $52,460. 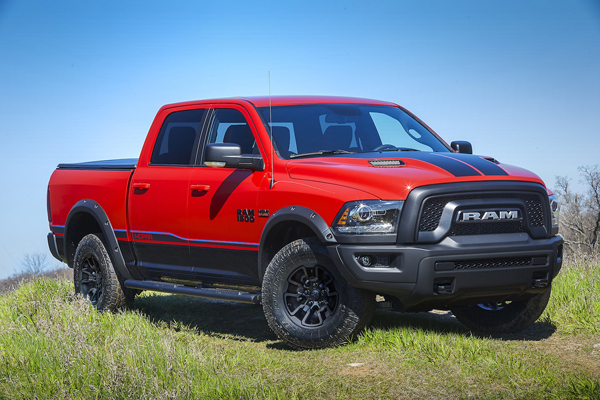 Read more about the Mopar ’16 Ram Rebel, and build your own, right here. ### The post BE SEEN… AND HEARD appeared first on Buffalo Cars.